The Smoot-Hawley Act is the Tariff Act of 1930. It increased 900 import tariffs by an average of 40 to 48 percent. Most economists blame it for worsening the Great Depression. It also contributed to the start of World War II. In June 1930, Smoot-Hawley raised already-high U.S. tariffs on foreign agricultural imports. The purpose was to support U.S. farmers who had been ravaged by the Depression. Instead, it raised food prices. It also compelled other countries to retaliate with their own tariffs. That forced global trade down by 65 percent. Smoot-Hawley showed how dangerous trade protectionism is for the global economy. Since then, world leaders advocate free trade agreements that promote increased trade for all participants. 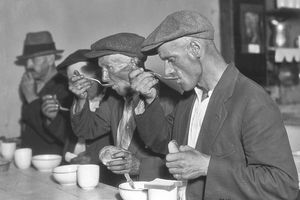 America had many characteristics of a traditional economy prior to the Depression. Almost 25 percent of Americans were farmers. Between 1915 and 1918, food prices skyrocketed as the world recovered from World War I. High demand for food created speculation in farmland. By the 1920s, farmers had taken on debt to fund growth and pay for the land. As Europe recovered, food prices abruptly returned to normal but debt-laden farmers faced bankruptcy. Congress wanted to protect American farmers from the now cheap agricultural imports. It had proposed other bills to support prices and subsidize food exports, but Calvin Coolidge had vetoed them all. So Congress shifted its strategy. It sought to raise farm tariffs to the same level as tariffs on manufactured goods. Raising tariffs had worked with the Fordney-McCumber Tariff in 1922. The 1930 Tariff Act is named after its sponsors. Congressman Willis Hawley from Oregon was the chairman of the House Ways and Means Committee. Senator Reed Smoot wanted to protect the sugar beet business in his home state of Utah. As the bill wound its way through Congress, every legislator wanted to add protections for their states' industries. By 1929, the bill proposed tariffs on 20,000 imported goods. Economists, business leaders, and newspaper editors completely opposed the bill. They knew it would become a barrier to international trade, other countries would retaliate, and the tariffs would also raise import prices. Congress debated the bill as the stock market crashed in October 1929. During his presidential campaign, Herbert Hoover argued for more tariff equality. As president, he made good on his promise. The timing of the bill's passage through Congress affected the stock market. May 28, 1929: Smoot-Hawley passes the House. Stock prices drop to 191 points. June 19: Senate Republicans revise the bill. Market rallies, hitting its peak of 216 on September 3. October 21: Senate adds tariffs to non-farm imports. Black Thursday stock market crash. October 31: Presidential candidate Hoover supports the bill. Foreigners start withdrawing capital. March 24, 1930: Senate passes the bill. Stocks fall. June 17, 1930: Hoover signs the bill into law. Stocks drop to 140 in July. Tariffs forced import prices up 45 percent. Millions of Americans had just lost everything in the stock market crash. Overnight, imports became unaffordable luxuries for all but the wealthy. It made it harder for those who lost their jobs to afford anything but domestic goods. Canada, Europe, and other nations swiftly retaliated by raising tariffs on U.S. exports. As a result, exports fell from $7 billion in 1929 to $2.5 billion in 1932. Farm exports fell to a third of their 1929 level by 1933. Global trade plummeted 65 percent. That made it difficult for American manufacturers to remain in business. For example, tariffs on cheap imported wool rags rose by 140 percent. Five hundred U.S. plants employed 60,000 workers to use the rags to make cheap clothing. U.S. auto manufacturers suffered from tariffs on 800 products they used. At the time, exports comprised 5 percent of gross domestic product. As part of his campaign, President Donald Trump advocated for a return to trade protectionism to increase U.S. jobs. Upon his election, he immediately withdrew from the Trans-Pacific Partnership, the biggest trade agreement since the North American Free Trade Agreement and repeatedly referenced plans to renegotiate NAFTA with Mexico and Canada. He announced a 25 percent tariff on steel from allies such as the European Union, Japan, and China; these countries announced retaliatory measures. Protectionism would have an even more devastating effect in modern times than it did in 1929. Exports now comprise 13 percent of U.S. GDP. The United States exports a lot of oil, commercial aircraft, food, and automobiles. These industries will suffer a great deal from a trade war.